When you’re just starting to build a wardrobe, costs can be daunting. 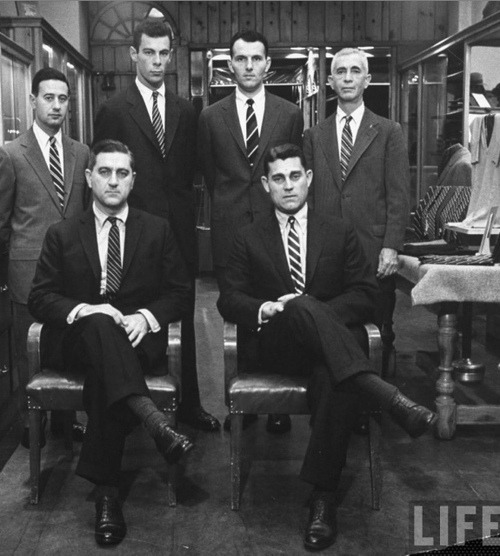 Well-tailored suits often run into the four-figures; good sweaters are commonly in the low hundreds. One way to manage your costs is to know where you can cut back. And while there’s something undeniably satisfying about wearing a tie from the likes of Drake’s, Sam Hober, and E.G. Cappelli, accessories are one of those areas where you can scrimp without anyone noticing. 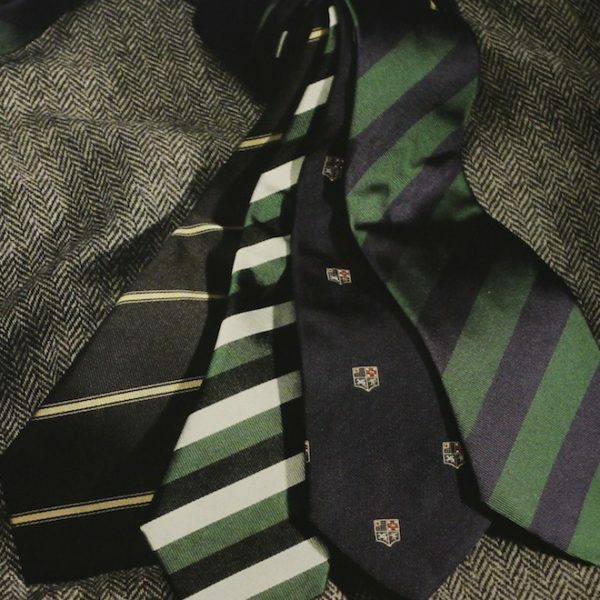 If you’re just starting to build a tie wardrobe, search for striped silks on eBay – what are traditionally known as rep stripes. The advantage of rep stripes is that they’re simple, unassailably in good taste, and wearable with almost anything – from smooth and silky suits to rough and tweedy sport coats. English foulards (which are those silk prints with small, repeating, geometric shapes) and paisley ancient madders, on the other hand, often look best with either one or the other, but not both. Which means if you’re building a necktie wardrobe, it’s better to start with a good foundation of rep stripes and solid-colored grenadines before you branch out to raw silks, boucles, or unusual prints. It used to be that men could only own one striped necktie. The style originated in the early 20th century, when decommissioned British officers wanted to continue wearing their regimental colors after they returned to civilian life. 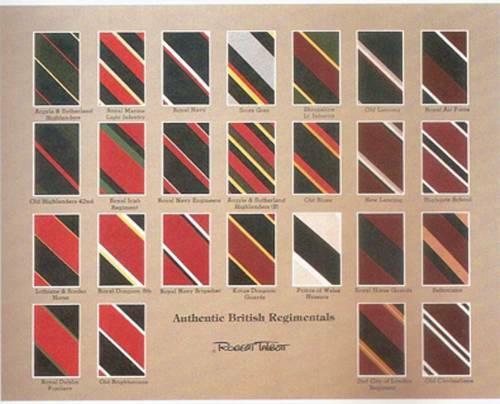 Hence, we get the term “regimental silks” for how those colors denoted those officers’ service. After a while, the practice was taken up by men in exclusive clubs or colleges, such as the students of Trinity College wearing navy ties with white stripes, or members of the Hawks Club wearing red ties with yellow stripes. 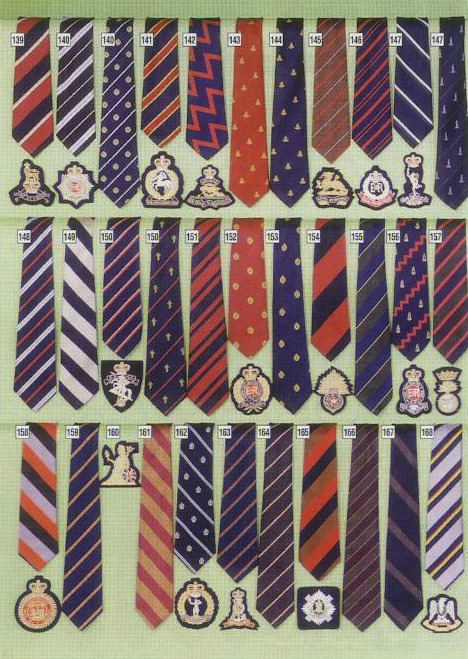 It was inconceivable that you could ever buy these ties in a store, as they were for members only, which is why men could only wear one style. The social meaning of these ties has largely been lost, so men can mostly wear whatever they want today. If you feel sensitive about it, however, you can always opt for the American way. British rep stripes typically run “up” when facing the wearer, such that the stripe is low on the left, then high on the right (see the first photo above). 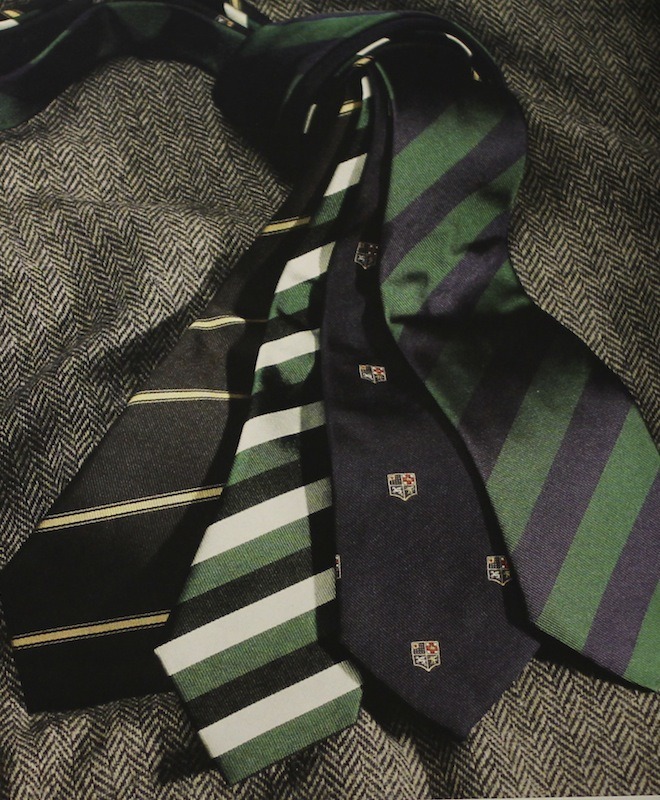 When Brooks Brothers started making their rep stripes nearly a hundred years ago, they didn’t want to offend their British counterparts, so they reversed the direction. American rep stripes mostly run “down” – high on the left and low on the right (see second photo above). Frankly, I think the American design looks better. Avoid Busy Patterns: Simple stripes will always be safer than those that try to get too creative. Basic pencil and block stripes are timeless, whereas this and this are dizzyingly bad. Stick with Dark Colors: The occasional light colored tie can make for a nice summer accessory, but you’re always better off with darker burgundies, greens, browns, and of course blues. They contrast well against white and light blue shirts, and can be paired with almost any kind of sport coat or suit. Watch for Sheen and Texture: Watch out for silks that are overly shiny, which can look too much like polyester, or things that feature jacquard weaves (where a pattern has been woven into a tie). Jacquards aren’t necessarily bad, but some can look like the material on your grandmother’s couch. Know Your Size: Ties are a lot easier to size than other items, but you’ll still want to pay attention to the numbers. 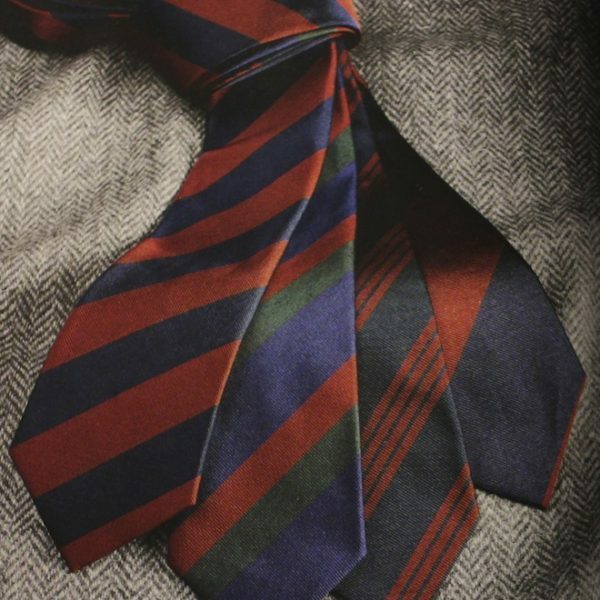 Choose a tie that’s about as wide as your jacket’s lapels, so the two look harmonious. 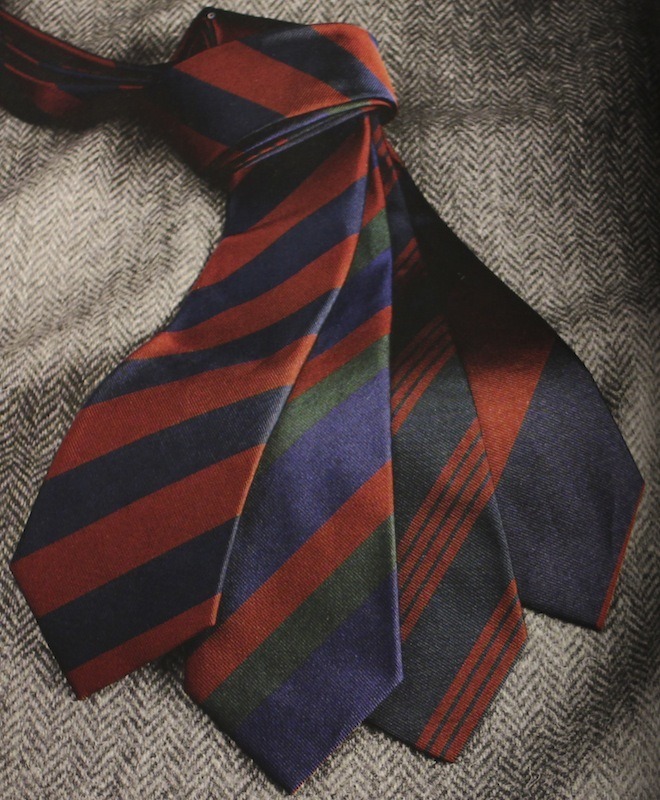 Classic ties should be around 7cm to 9cm, with 8cm often being the sweet spot for most people. Similarly, choose a length so the tie terminates at your belt line. The tail end shouldn’t be more than three inches away from the tip of front blade when worn. Spotting Damage: The hardest part about buying second-hand ties on eBay is that you can’t easily spot any damage that’s happened to the interlining. You can see if the tie has been stained or snagged on the outside, but it’s the interlining inside that gives the accessory its life (and creates a knot you want). For that reason, you may want to avoid really old ties. Even if the shell looks good, the interlining may be pulled out of shape, which can be expensive to restore. Should you need a place to clean or restore a tie, however, go to TieCrafters.